Remember back in the early days of the internet when display ads, pop-up ads and pop-unders ads were largely frowned upon but we eventually got used to these things because they helped make content free? Well I can assure you the same is never going to be said for embeded Auto Play Video Ads. Especially when they're used so poorly by sites such as yours. I"m not opposed to advertising. I'm not even opposed to video advertising. Heck I earn income from ads myself. What I object to is multiple embeded video ads on one page, all set to auto play, along with embeded display ads, fly out menus, additional featured story lists and comment loaders all trying to display their part of the page whilst getting completely in the way of the page's ability to load the content I actually clicked over to see. I'm sick of trying to play a featured video on a site when up to four other auto play video ads are all trying to load and play even though they're not even on screen. 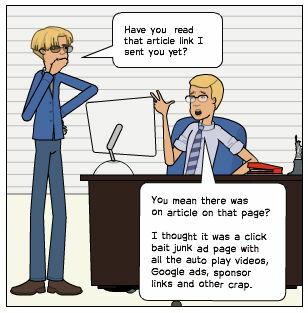 Often the ad players will all be trying to play the same ads. What happens then is the actual video I came to see takes ages to load, if at all. When the video does play it stops and starts, buffers constantly, and only plays every 10th frame if I"m lucky. If I try to read the accompanying article whilst I'm waiting the page refuses to scroll because the ads and video ads are still loading causing the entire page to slow down. If it does scroll at all it'll jump down a page at a time even though I'm not using the page down feature. Trying to scroll back up meets with a similar issue making reading the article virtually impossible. And don't even get me started on your next to useless mobile sites that try to display some of the ad content, often failing miserably and almost as often crashing the browser on my mobile devices. Remember 'content is king'. That hasn't changed. I'm far beyond losing count of the number of times I've clicked onto your sites, with your click bait headlines, and then had so much trouble accessing the content I came to see. It's enough time for me to think to myself... "You know what? I don't actually care what this article was about." I shut down the page. Content unseen. Ads ignored. Way to go. I hope your poor implementation of video ads is only affecting a minority because I'd hate to think of all the ad revenue you might be earning if you know... you didn't cripple your content with auto play video ads and other plug-ins. I don't know about all that but I used to get videos starting on my page automatically which added to me using too much of my internet or whatever it was, until I changed to having more for less money which doesn't affect me now. I think it was you who told me I could go select for the videos not to start auto, but I don't know if that's what you're talking about. I can't remember where it was I went into now, but it would be Settings I expect and that fixed that up. What I get now is when they send me things in an email from Twitter to see the most poplar videos, they start playing as you scroll, but, as I found out, you have to click them to hear the sound. This can divert you sometimes to looking at some stuff until you realise and either close or delete the email. I'm talking about on Face Book of course. I'm talking about on regular Magazine/blog/Newspaper style websites which don't come with settings you can adjust - would be great if they did.